When going out and looking for a lock, you're going to run into a lot of different brands, options, types, and varieties. Even with all of this though, it's pretty simple to break it all down and figure out exactly what it is you need. Breaking down the different types of locks will be the first step in understanding what it is you need for your locks and security, so let's do that. Most of us know what a dead-bolt lock is, but we don't all know what it's used for and all of the different categories it can be placed in. Dead-bolts come in single cylinder, double cylinder, and lockable thumb turn. A single cylinder lock is what we all think of when we think of a dead bolt, and can be found in most American homes today. It uses a single cylinder and is engaged with a single lever from the inside. 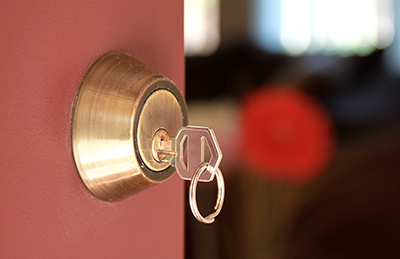 A double cylinder dead-bolt is one that has no lever, but rather, a keyhole on both sides. This may seem pointless, but the lever has a serious disadvantage. If a criminal can somehow get a small rod under the door, or through a window, etc. then he can use it to easily flip the lever and unlock the lock. Double cylinder locks prevent this, however it comes with its own set of disadvantages too, such as when you might need to get out of your house in a rush for an emergency. A lockable thumb-turn is the perfect combination between these two types of locks. It's exactly what it sounds like, a thumb-turn that can be locked with a key so that it doesn't lock or unlock the door, no matter how it moves. This is super good news for people who leave for extended periods of time, and when you're in the home, the dead-bolt can just be used like a normal one. Just like dead-bolts, most of us know what knob locks are. They are exactly what they sound like - locks that are placed within the knobs of the doors that they are used on. However, what you probably don't know about knob locks is that they can be pretty dangerous for security situations. Almost all knob locks are placed within the knob themselves, instead of the surrounding door frame or parts, meaning they can be easily bypassed without much issue. Do not use knob locks as your main source of security. If you are currently doing so, locate a professional who sells locks, and find out the best fix for you. Lever handle locks are somewhat like knob locks, except that they are a little more secure. A lever handle is what you see on classroom doors, in hospitals, and in other commercial buildings that obtain high amounts of traffic. Although they are a lot more secure, these should still never be used on external doors that lead to the outside unless you plan on using them in addition to a dead-bolt lock.